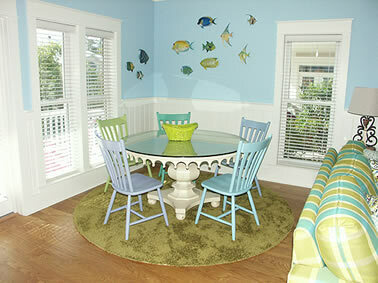 Catch the Wave Beach House is a vibrant, beachy 2,600 square foot, 4-bedroom 4-bath beach house located in the heart of Seagrove Beach Florida. 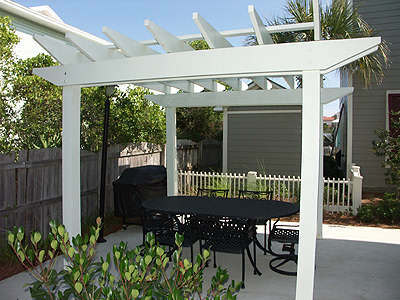 This home is only about a short 5-minute walk to the beach and only a 1 to 2 minute walk to the community pool. 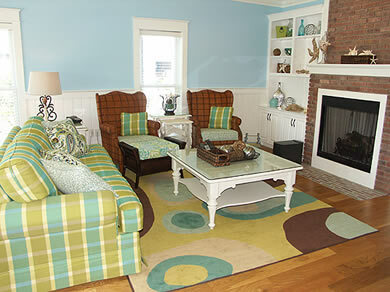 The home is a perfect home for a family vacation with two large master suites on second floor, a bedroom on first floor, and a bedroom with a connecting lounge/TV room on third floor. 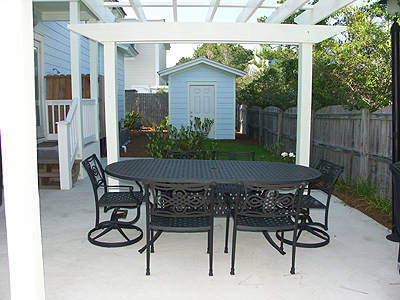 With both breakfast and dining tables indoors, a breakfast bar, and dining table and chairs outdoors, there is plenty of roomy space for family gatherings in or out. 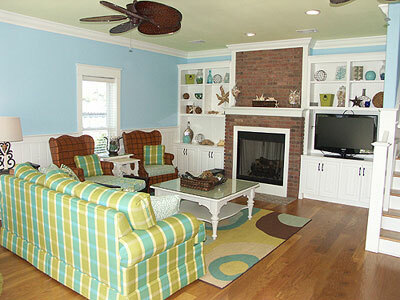 Below are more details about this beautiful home. 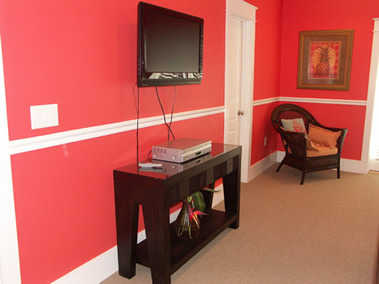 1st floor has a nice living area with TV and DVD Player. 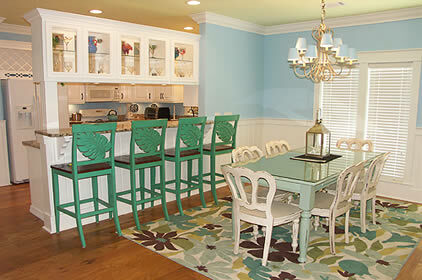 There is a dining table, breakfast table, and breakfast bar. 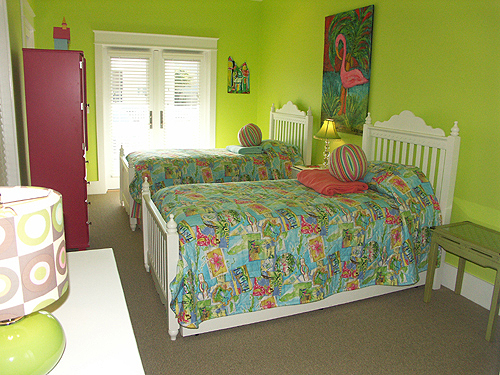 There is a bedroom with two twin trundle beds and TV, a hall bath with tub/shower combo, and a washer/dryer in utility pantry. 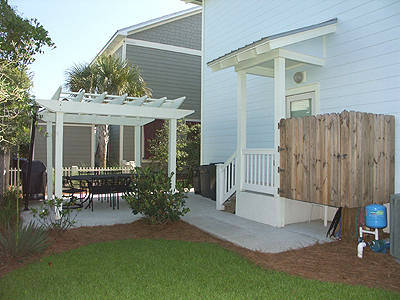 The back door accesses to the yard and patio that has a table and chairs, charcoal grill, and an enclosed outdoor shower. 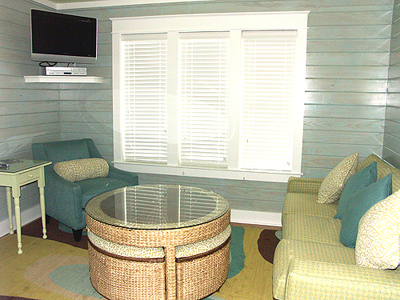 Second floor has a desk/work area at the top of the landing with Wifi and phone. 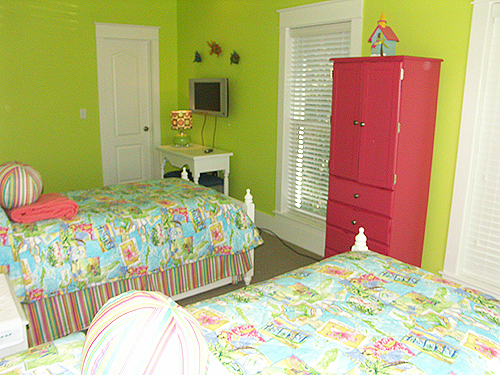 There are two king bedrooms on second floor one king bedroom has a TV, DVD player, and private bath with double vanity and walk-in shower. 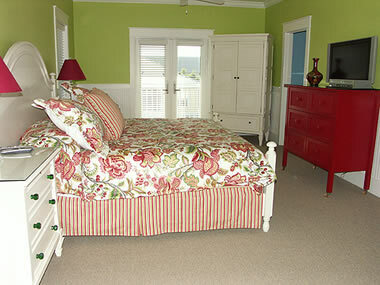 The second king bedroom has a TV, DVD player, and adjoins to the hall bath with tub/shower combo. 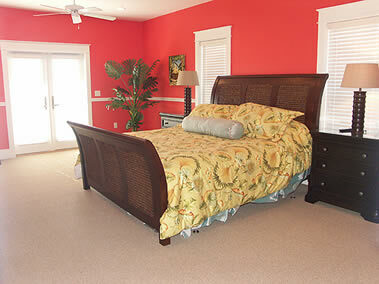 Both king bedrooms connect to the second floor screened-in balcony. Third floor has a lounge/TV room, microwave, undercounter refrigerator, full bath with shower, and a bedroom with a full-size bed. 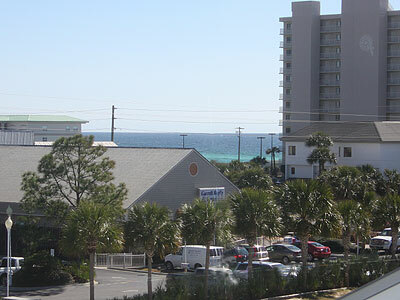 A distant Gulf view is from the third floor balcony. 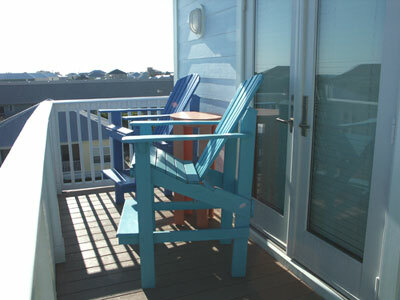 The porch and balconies all have plenty of furniture for relaxing outdoors. 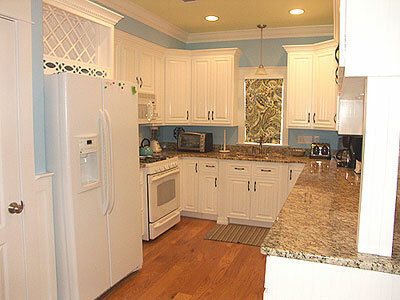 Well equipped kitchen with cooking utensils, wine glasses, etc. We had such an incredible time at Catch the Wave, I'm not sure words can describe it! I kept warning everyone it might not live up to the online description and photos, but we all agreed it did so - and then some! 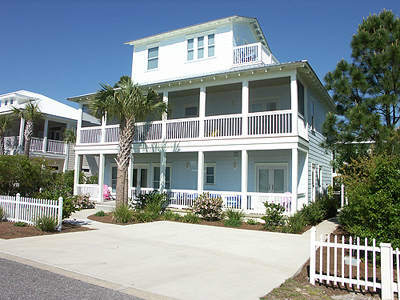 We came for Spring Break '09, when unfortunately, the weather was not completely on our side, but having such a lovely place to stay more than made up for the look of things OUTSIDE! 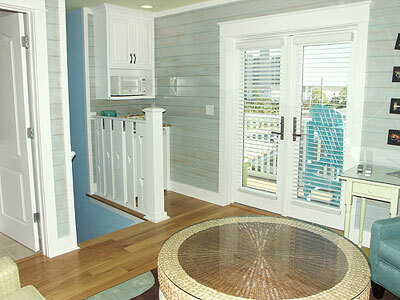 We discovered we knew people staying nearby, and though they were proud to have oceanfront property, we quickly became "the place to be" because there was so much room and such wonderful amenities! "Well appointed kitchen" the description said... how true! We wanted for nothing while there! 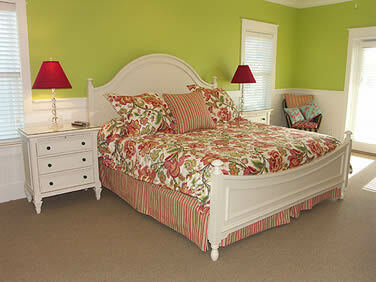 The appliances were top-notch, the rooms were decorated with wonderful style, everything was absolutely marvelous. I hate to say too much, so I know it will be available if we have the time to come back! Thanks for providing such a wonderful place and terrific memories for us! We LOVED our week at this home! Catch the Wave far exceeded our expectations. 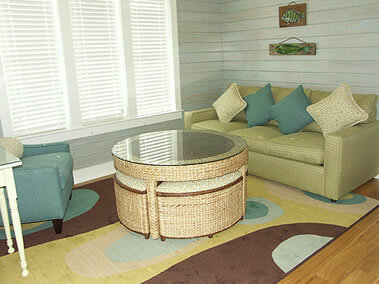 Beautiful beach decor...elegant, yet very comfortable. It had everything we needed from a crockpot to a blender. It truly is a beautiful home and the pool is literally just a few steps away from the house. 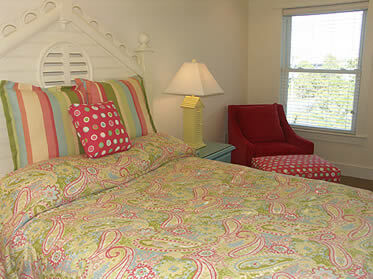 Even better, you will be sitting on the beach in about 2 minutes! I will be back! 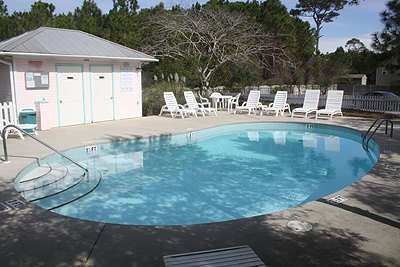 Winter ....................................................... Nov 1 - Feb 28, 2020.......... $145/night .................$1015/week - (2-night min.) *** Thanksgiving and New Year's are 7-NIGHT MIN. Christmas is 3 night minimum. * PLEASE NOTE: A cleaning/laundering fee, administrative processing fee, and state and local taxes are extra. Please call or email for the total rate. 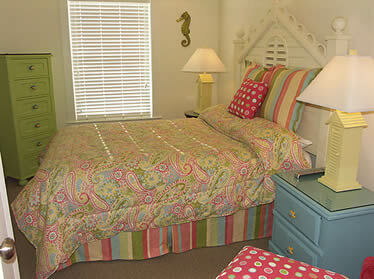 * If wanting to stay only 3 nights in spring an arrival day other than Friday is usually preferred, but please ask. 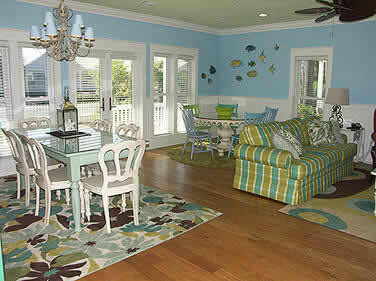 #BOOK DIRECT - CALL US TODAY 850-622-3304 to reserve this beach house or other vacation rentals.